The Dareton Primary Industries Institute services horticultural producers in the Lower Murray Darling region of the state. Research is primarily directed at improving the sustainability of citrus production. The Institute is located in the major fruit growing area that forms part of the Sunraysia irrigation region of New South Wales and Victoria. The Institute is in the Coomealla irrigation area, 3km from Dareton and 10km from Wentworth (the town situated at the junction of Australia’s largest rivers — the Murray and the Darling rivers). The site is 243ha in area, and about one-third of this area has soils suitable for horticulture. The main horticultural industries are grape (wine, dried and table), citrus and almonds. Minor crops include avocados and pistachios. Recent major developments have occurred with the expansion of the almond industry. The Dareton Institute is the site of the National Citrus Arboretum Collection and a source of high health status propagating material for the Australian citrus nursery industry. The citrus budwood and rootstock seed supply scheme is managed through Auscitrus, an independent organisation working in association with NSW DPI at Dareton. The Dareton Primary Industries Institute is located on 243 hectares irrigated from the Murray River with a total staff of 17, which includes 2 co-located Public Works staff. Research - jointly funded by NSW DPI and industry – primarily is focused on the development of new citrus varieties and rootstocks to address current and future market requirements. NSW DPI at Dareton is the lead agency for citrus R&D in Australia with significant investment in staff and facilities to service the Australian citrus industry. We have key functions providing new rootstock choices for the Australian citrus industry with the commercial release in May 2017 of 6 new citrus rootstocks resulting from trial work at Dareton over a 19 year period. The new citrus variety evaluation programme rapidly evaluates the majority of new variety introductions to Australia and determines their suitability to local climatic conditions and provides fruit for market testing and potential future commercialisation. The citrus development program aims to deliver the most up to date and progressive information on citrus growing practices to the citrus industry. Development programs include the regular delivery of workshops on pruning, nutrition and grafting. These workshops are now being extended to include soil management and fertigation. 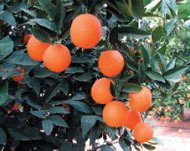 Citrus information is provided through Citrus Connect, a web based newsletter. Information is also provided to all citrus growers regarding topical citrus issues via a national Horticulture Innovation Australia Limited funded "Season update" project coordinated by Citrus Australia Ltd. The Dareton site provides a resource for the citrus industry to view new varieties and rootstocks and be updated on the latest developments in these fields. Visitors, both locally and international are a regular feature of Institute activities, with 330 visitors during 2016. The Institute also has a compliance and regulatory function with 2 Fisheries Officers who manage the far western division fisheries resources and a biosecurity officer with responsibilities for plant and food safety in local horticultural industries. Auscitrus has plantings on the Institute for the supply of citrus propagation material to the industry. This function will continue for several more years as a formal relationship with NSW DPI, but will end into the near future due to the establishment of their own property in the Dareton region. The Institute has expanded its role in supplying high health status propagating material with the establishment of grapevine rootstock and scion plantings for use by the viticultural industries. The Victorian and Murray Valley Vine Improvement Association own these plantings and conduct most day-to-day cultural operations with Dareton farm staff providing support when required. The station has also expanded its role in germplasm maintenance with establishment of the National Germplasm Collection of Grapevine Varieties for the Australian Vine Improvement Association. In July 1948, the Hon. EH Graham MLA, Minister for Agriculture, announced the establishment of the Horticultural Research Station. The original station buildings were completed in 1954. Between 1962 and 1964 a packing shed, an additional machinery shed and a manager’s cottage were constructed. The Department’s district advisory service was provided from the station following the construction of an office building in 1967. Dareton became the first site where the delivery of the Department’s services was integrated. In the early 1980s the Community Employment Program was introduced by the Commonwealth Government. This program financed, in part, a new office and laboratory building for research staff, and a new conference room which is used for grower meetings, small workshops and seminars. The appointment of an Irrigation Officer to the staff at Dareton Agricultural Research and Advisory Station in May 1987 allowed the Station to expand its advisory services to the community by providing a technically based pool of knowledge on irrigation hardware. Fisheries and Forestry officers were co-located at Dareton following the merging of departments in 2004. In 1971, the Australian Agricultural Council adopted a program to provide and maintain a source of high-quality propagation material. The program is run by the Fruit Variety Foundation (FVF) and currently includes a number of crops including citrus. The citrus foundation planting for the FVF was established at Dareton Agricultural Research and Advisory Station in 1977, and is now held in 2 locations at the Elizabeth Macarthur Agricultural Institute, Camden and the Auscitrus property, River Road, Dareton. The Institute also has a major service function in supplying citrus budwood and seed to the Australian nursery industry. About 700,000 buds are supplied annually. Budwood was first supplied in 1972. Commercial varieties that are supplied are of known health status, and this is regularly monitored to ensure quality of material. Budwood of other citrus varieties is also supplied, as well as over 700kg of citrus seed. Auscitrus (Australian Citrus Propagation Association) is an independent organisation working in association with NSW DPI at Dareton. The Dareton Primary Industries Institute also maintains grapevine plantings for the Victorian and Murray Valley Improvement Association. Several hectares of grapevine rootstock and scion varieties are managed for the production of high-quality, known-health-status propagation material for use by the viticultural industries. The national germplasm collection of grapevine varieties was also established at Dareton for the Australian Vine Improvement Association with initial plantings in 2003. The climate is dry with warm to hot summers and mild winters. Our temperature range can be as high as 45°C in summer to a minimum of -2°C in winter. Average total rainfall is 280 mm. Rainfall is evenly distributed throughout the year; however, there are proportionally more wet days per month during winter. Heavy rains in late January to March can reduce grape yields. Evaporation is high at 2400mm per year. Mild frosts occur during the winter months.